Snyder, Lorraine. "Duff Gibson". The Canadian Encyclopedia, 04 March 2015, Historica Canada. https://www.thecanadianencyclopedia.ca/en/article/duff-gibson. Accessed 20 April 2019. 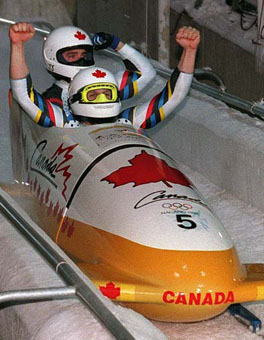 Duff Gibson, skeleton racer (b at Vaughan, Ont, 11 Aug 1966). Duff Gibson is Canada's first Olympic gold medallist in skeleton and, 39 years old at the time of his win, he currently holds the record for being the oldest individual gold medalist in Winter Olympic history. 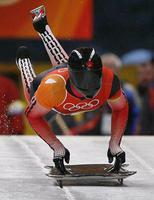 Duff Gibson, skeleton racer (b at Vaughan, Ont, 11 Aug 1966). Duff Gibson is Canada's first Olympic gold medallist in skeleton and, 39 years old at the time of his win, he currently holds the record for being the oldest individual gold medalist in Winter Olympic history. Gibson's family had been active in national and international competition for much of Gibson's life: his father was a Canadian lightweight judo champion and his uncle represented Canada in rowing at the 1984 Los Angeles Games. As a youth Gibson pursued several activities, playing hockey, wrestling, and ultimately taking up rowing at the University of Western Ontario before pursuing speed skating while attending the University of Calgary. 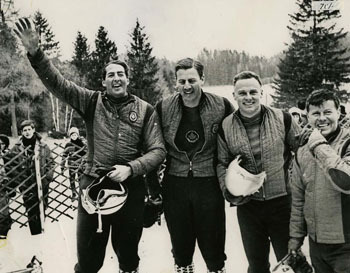 After brief stints with both bobsled and luge racing, Gibson began elite skeleton racing at age 33. Upon learning that skeleton competition would return to the 2002 Salt Lake City Olympics, and dreaming of representing Canada at an Olympic Games, he began training and ultimately competing in 2000. Duff had a promising finish just prior to Salt Lake City, earning a bronze at the World Cup, but he ultimately finished 10th in Olympic competition. Gibson's technique and endurance continued to improve after Salt Lake City: he placed second in the 2003-4 World Cup standings, won the 2004 World Championship, and finished third in the 2004-05 World Cup standings. Prophetically, Gibson won the 2005 World Cup on Cesana Pariol, the track he would sled down at the 2006 Games. Although fellow teammate Jeff Pain was favoured over Gibson to win a medal at Torino in 2006, Gibson's two runs down the track resulted in a combined time of 2 minutes, 2.17 seconds, securing him the gold medal on 17 Feb. Germany's Matthias Biedermann won the silver and teammate Pain earned the bronze. Wanting his final ride to be a gold medal victory, Gibson vowed that it would be the last skeleton run he would ever make. He announced his retirement from skeleton racing soon after, in 2006, resuming his career as a firefighter in Calgary, Alta.